Absent from the discourse spurred by the motion passed in the National Assembly on 27 February is what could be achieved in the interim for land reform programme using existing legislation while the country awaits a verdict on the constitutional amendment to determine whether is possible to expropriate land without compensation or not. Tenure rights of rural South Africans remain insecure within the plethora of existing laws and mechanisms that could be used to secure tenure rights as well as fast-track land reform. The Constitution Review Committee has started to facilitate public participation by inviting stakeholders to send written submissions including requests for oral submission by 15 June as mandated by the National Assembly in concurrence with the National Council of Provinces to conduct public hearings to elicit public comment and report back to Parliament by mid-September. However, if the constitutional amendment for Section 25 of the Constitution to make it possible for expropriation without compensation is recommended in the report by the committee, the support of two-thirds members of National Assembly and a vote of six out of nine provinces is still required – including the ruling by the Constitutional Court. Changes to Section 25 – which forms part of the Bill of Rights – may impinge on the founding values of the Constitution, this would then require a 75% parliamentary majority. This might require taking the matter to the courts for a declaratory order necessary. Moreover, the amendment may fundamentally affect the entire legal jurisprudence surrounding property ownership. While this process unfolds with much scepticism, the need for land in both urban and rural South Africa remains a haul. Drawing attention to the countryside while acknowledging the struggles in urban areas, what are the current laws that make provisions for farm dwellers or former labour tenants, people on communal land and those in need for commonage? In 1996, Parliament passed a national law entitled the Interim Protection of Informal Land Rights Act (IPILRA) to give effect to section 25(6) and (9) of the Constitution. IPILRA was intended to be a temporary law that would work like a safety net by protecting people against the deprivation of their land rights until a more detailed permanent law could be passed to strengthen people’s rights. It is 2018, and communities are still awaiting a detailed permanent law. In communal land areas across South Africa, previously called Bantustans, many have witnessed the recent eruption of the lucrative mining industry, as well as suffered the severe impacts of mining without having granted consent, resulting in environmental degradation, involuntary relocation and bogus compensation for resettlement, disturbed livelihoods and loss of ploughing fields. At the heart of this suffering is a lack of transparent consultation methods, which go unchallenged by mining companies who want simply to “tick a box” under the requirement of consultation in the event of being granted a mining licence. IPILRA might not solve all the challenges that communal area communities face, but it is an important and under-utilised piece of legislation that provides a means to tackle various land-related challenges through mandated consultation and, more importantly, consent from the people who will be most directly affected by mining, or elite capture. IPILRA provides that people cannot be deprived of their informal rights to land unless they consent or the land is expropriated by the government and suitable compensation is paid. If the principle of IPILRA had been in place and embraced during the application of mining rights, the Wild Coast community of Xolobeni would be in a vastly improved position than being embroiled in litigation. If Australia’s Mineral Resources Commodities (MRC) had sought through consultation and negotiation to win the free and informed consent of this community prior planning to mine the dunes for titanium, many of the challenges could have been addressed. In Western Cape, the Malmesbury Emerging Farmers are currently facing an eviction set out by the Swartland Municipality. The municipality wishes to cancel the lease agreement between the emerging farmers and themselves as well as remove the farmers from the commonage land, a land that is held or managed by the municipality and is intended for the use by black small-scale farmers – to keep cattle to slaughter, to milk cows and the cultivate crops. This happens despite the right to use municipal commonage which is constitutionally mandated by both the Constitution and Land Reform Policy to redress historical injustice and meet the quotas for the advancement of the municipal residents. The Municipal System Act obliges municipalities to be developmental organisations that “move progressively towards the social and economic upliftment of communities and the provision of basic services to the poor and disadvantaged”. The context of farm dwellers or former labour tenants’ dates back to colonial remnant labour system that forced black landowners to become tenants on their own land. Families had to earn their tenure, by their labour, on the land that was handed to whites. 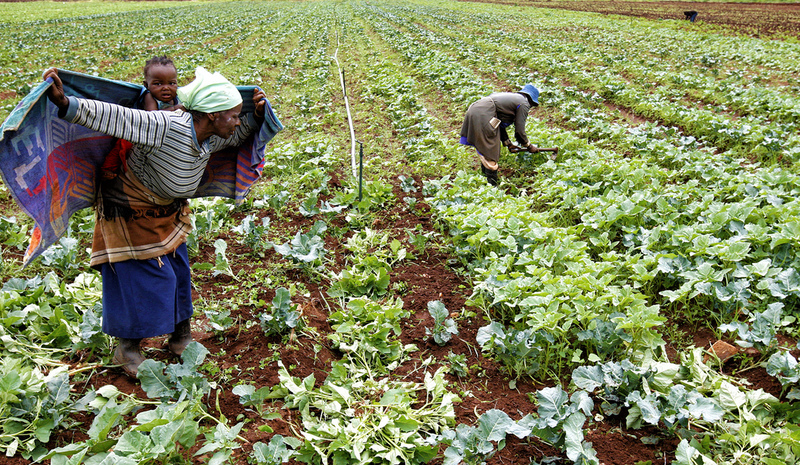 The 1996 Constitution obliged the state to enact land tenure that is legally secure for farm dwellers and farm workers. Hence, the parliament passed two main pieces of legislation: Land reform’s Labour Tenant Act (LTA) and the Extension of Security of Tenure Act (ESTA). Under the LTA, labour tenants should be provided with the security of tenure or ownership of land that they use to live on, grow crops and keep livestock. Meanwhile, ESTA sought to provide tenure rights of farm dwellers in the face of evictions by outlining the duties of landowners and procedures to followed including the redistributive element for an off-farm settlement. However, to date – instances of farm evictions and human right violations persist on farms. In the Western Cape, Drakenstein Municipality is set to witness about 20 000 evictions of farm dwellers. This is due to law enforcement failing to grasp provisions outlined in both LTA and ESTA. These illegal evictions add to escalating numbers of informal settlements in the urban areas. It is for the apparent reasons that Tshintsha Amkhaya is set to embark on a national campaign calling President Cyril Ramaphosa to sign a formal moratorium, to halt ongoing evictions following the promise he made in 2014 in The Doorns to stop farm evictions until an amicable solution is found. The failure to secure the property rights of rural communities shows a clear policy gap between citizens and rights to land as per the Constitution and the attitude and practices of the state, traditional leaders, white farmers and mining companies in relation to such rights. In the rural South Africa, this has had dire consequences for communities who struggle to say “no” to mining, forced relocations and farm evictions, often escalating into violent protest and conflict. A constitutional amendment would not necessarily change deeply embedded practices. There is a systematic non-implementation of the law that benefits a particular pact but certainly not rural citizens. This blog was originally posted as an op-ed on the Daily Maverick.